For a chef, cooking at the James Beard House in New York is considered the culinary equivalent of playing Carnegie Hall, while Thanksgiving dinner is called the Super Bowl of meals. So how is it that 20-year-old San Diego culinary student Rebekah Suarez — who is one of just six students from around the country chosen to help cook Thanksgiving dinner Thursday at the James Beard House — seems as calm as a julienned cucumber? “I’m not nervous. I know I can do it, and even if I can’t do something, at least I’ll learn from it,” Suarez said confidently a few days before she left on her all-expenses paid trip to New York. Many of the nation’s — and world’s — most accomplished chefs have cooked special meals at the venerable Beard House, named after the legendary chef and author. (In fact, JoJo Ruiz, of downtown San Diego’s Lionfish, will be there Nov. 29.) The annual James Beard Awards are likened to the Oscars of the food world. The six-course, $140 Thanksgiving dinner will be a gourmet affair befitting its setting; the turkey and fixings include smoked guinea fowl porcini quenelle and truffle-crusted turkey roulade with foie gras dressing. On Friday, Suarez, who lives in Linda Vista, said she didn’t know what portion of the meal she’d be working on. She does know she’ll be too busy for sightseeing in New York or eating at the city’s A-list restaurants. “I have a packed schedule. I think I’ll have something like four hours free in five days,” she said, her eyes growing wide. That sounds like a typical week for Suarez, who said she spends 16 hours a day at the Mission Valley campus of the Art Institute’s International Culinary School. When not in class, she works in the warehouse tracking inventory, she tutors her fellow students, studies recipes, computes ingredient ratios and leads her classmates as the captain of the schools culinary competition team. 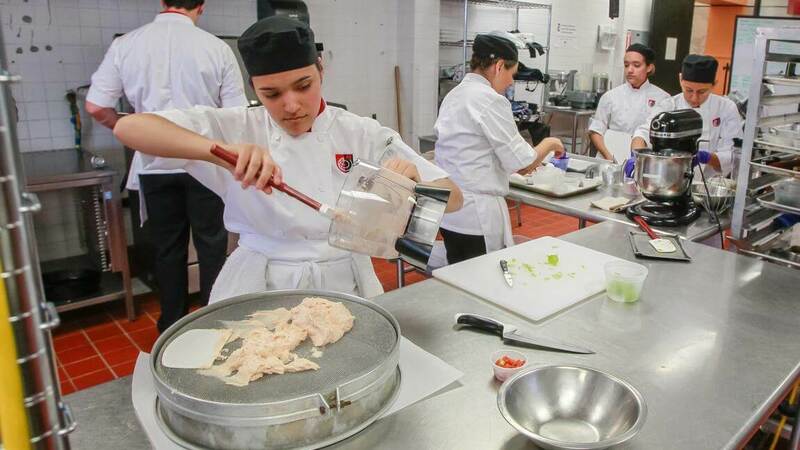 On Friday, the five member team — which includes Rebekah’s twin sister, Sarah — practiced their knife skills and cooked a timed four-course meal in preparation for the Dec. 8 state competition in Hollywood. Sarah Suarez, who is joining her sister in New York, will likely be her biggest cheerleader there. “I’m really proud of her. She deserves this so much. She earned it,” Sarah said. But both sisters impress their instructors, said chef Rudy Kloeble. “It’s been a lot of fun watching these two grow. These two have stood out from the first day, we could see the initiative,” he said. Growing up in a family of 11 children, ranging in age from five months to 26, Rebekah said her parents are supportive of her career and dream to have her own restaurant. And her mom taught her to always add one special ingredient to her dishes. Being in New York doesn’t mean the sisters will be missing out on Thanksgiving dinner at home; the family doesn’t celebrate the holiday. “My father says we should be thankful every day of the year, not just on one day,” Rebekah said. She’ll be grateful, though, if the customers celebrating at the Beard House can taste the passion she’s bringing to their meal.